Our Mission | Why We Are Here? 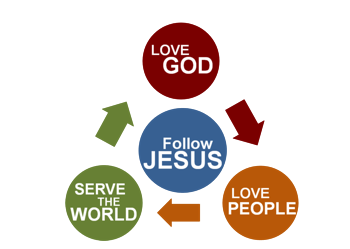 Growing followers of Jesus who love God, love people, and serve the world. Following Jesus is a process of growth and transformation. God loves us just as we are, but He loves us too much to leave us unchanged. Ephesians 4:11-16 highlights that the various gifts that God gives to the Church are for the purpose of growing mature followers of Jesus. Go, therefore, and make disciples (Matthew 28:19). Discipleship is not just a one-time decision, but a journey of following Jesus day after day. Gateway exists, therefore, to actively help one another mature as followers of Jesus. Our process for making disciples or growing followers of Jesus will be to move continually into deeper engagement with God, one another and the world around us in love and service. "Love your neighbor as yourself" (Luke 10:27). We grow and are formed through relationships so much so that the Bible holds love and God and love of people together. We cannot fully love one without the other. Accountability and growth through mentor relationships and small groups are two primary ways we can become more like Jesus. Jesus summarized the whole of the Bible by highlighting two great commandments. The first of these is to "Love the Lord your God with all your heart and with all your soul and with all your strength" (Deuteronomy 6:5). Worship and teaching are two priorities that will enable us to notice and draw near to the God who is always with us. We love God and our neighbor by participating with Jesus in serving the world. We, therefore, are seeking to demonstrate in tangible ways the good news of Jesus by proclaiming the gospel, showing compassion and working for redemptive justice in our local community and around the world.